All Metropolitan Transit System and North County Transit District services will be free Tuesday as part of the San Diego Association of Governments‘ support of National Rideshare Week. 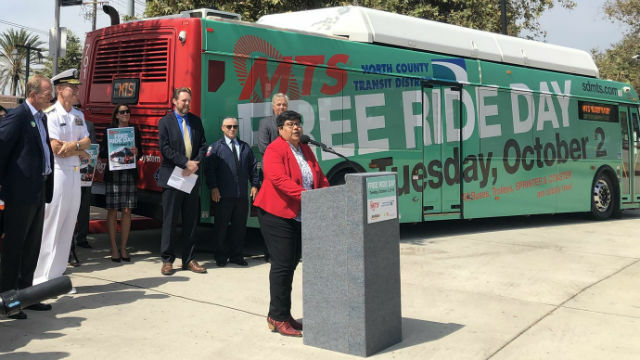 MTS and SANDAG representatives will welcome public transit customers with rider appreciation events at two transit centers in San Diego County to celebrate the start of Free Ride Day. At the Old Town Transit Center, MTS CEO Paul Jablonski and SANDAG iCommute representative Antoinette Meier will give riders chances to enter a raffle featuring gift card prizes and a grand prize of one free adult regional transit pass valid for 12 months. At the E Street Transit Center in Chula Vista, SANDAG and MTS representative will also enter passengers into the raffle.